We exams arrived. Hours of study on the books, highlighter pens and worn. Night sleepless. The stress psychophysical is around the corner but be careful not to overdo it! Here are some tips to prevent the situation trace with the obvious consequences (examination not passed). 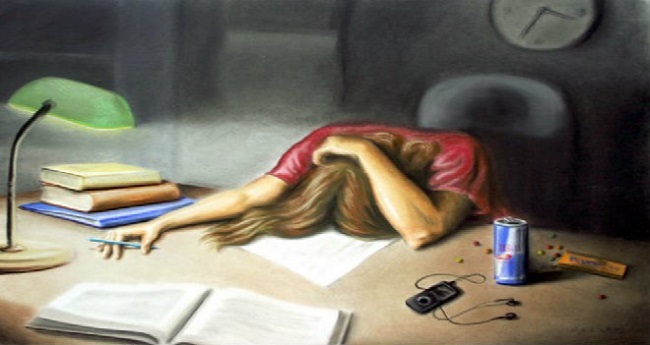 Many students to avoid pre-exam stress postpone the start date of the study. It ‘a good solution in the short term: no sleepless nights, no days spent in the library. Then the exam date is approaching inexorably and you have to do double the effort to pass it. Do not delay! At the other extreme, we find students who spend hours and whole days on the books. Self stimulate studying more: “I’m not doing enough, no I’ll never going at this rate.” Calm, there is no need to be so hard on yourself. Give yourself a break! You may also like to read another article on StudyWatches: 5 Tricks To Study With Greater Ease! First rule of three point: remember that you are human. You have to be realistic. Do not point the bar too high if you are not able to respect your schedule. Often when preparing an exam will cease to have a social life. Only books, books and books. It was wrong. Unplug it helps the brain to rest. In the exam the student’s diet essentially boils down to three things: coffee, colas and energy drinks. We think, mistakenly, that help us to stimulate and improve concentration. Wrong! Even in times of examinations must maintain a balanced diet, rich in high-protein foods. Do not forget to drink plenty of water, which helps the brain stay hydrated. And remember to sleep!